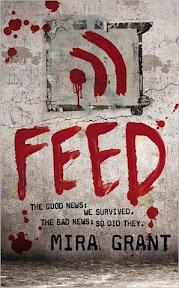 Feed [Audiobook Review] – my books. my life. In 2014, the cure for cancer and the cure for the common cold combined to form Kellis-Amberlee, a disease waiting to be awaken in every human being essentially making them a zombie. You die = zombie. You get bitten = zombie. Got it? Fast forward 20-some years. Georgia and Shaun Mason are bloggers (the news media can’t be trusted since the zombie rising) chosen to follow the man many believe will be the next U.S. President. With the threat of Kellis-Amberlee always on their heels, they find even more danger in their path. The premise sounds insane, right? Trust me when I say it is TOTALLY BELIEVABLE. Grant does such an amazing job building this world that you have to accept it. It’s our world. But with zombies. And slightly smaller technology. Georgia and Shaun filled us in on the history through their blog entries and Georgia’s thoughts. The details are fantastic and far too numerous to discuss here. The action starts immediately and doesn’t stop moving until the end. In a world of zombies, I guess you don’t have much time to sit still (unless you’re hiding). There was zombie fighting, political sabotage, and more. The characters and the relationship were also strong. Georgia and Shaun are closer than most brothers and sisters, and this was really the main relationship in the book. Which is different. But they still had their friends and coworkers and a somewhat dysfunctional relationship with their adoptive parents that I hope is further explored in further books. If I have one complaint about this book, it is that I got a little sick of all the blood testing (you have to test to make sure you don’t have Kellis-Amberlee). But then again, I walked through two metal detectors yesterday so maybe it’s not that different. And I think it is really annoying to the characters even if it is a part of their lives, so maybe that was the point. Please listen to the audio of this book. The narration is superb. Paula Christensen is the main narrator with Jesse Bernstein serving a supporting role. Christensen has these wonderful voices for the different characters. Georgia’s is straight-forward. Shaun’s is a laid-back-surfer-type. But my favorite is Steve, the security guy. You should listen just for this one. 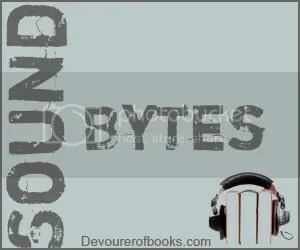 Check out other audiobook reviews today over at Devourer of Books. Ack! This audio has been on my list since Kathy and Jen both reviewed it. My library, strangely, does not have it. And they have everything. I’m going to keep looking and maybe they will get it at some point. I’m not a huge zombie person, but if the three of you say it’s good, then it is. The audio is download-only, which is perhaps the problem. Michelle found it downloadable for FIVE BUCKS on B&N.com, though. B&N.com has downloadable audio?? How did I not know this!! Thank you! I read this one but I would be interested in checking out the audio just to hear what the characters sounded like. I have never read a zombie book, but have to admit that I have been casting about for a good one. This one sounds like it’s a little more realistic than some of the others out there, and your thumbs up really makes me want to read it. I have already added this to my wishlist on the strength of your review. I will have to let you know what I think of it!